Catalogue of Organisms: I Can Has Mutant Larvae? I've covered Salinella and Buddenbrockia, now I'll move onto another of the 'living problematica', though today's subject is arguably not as problematic. Let me introduce you (assuming you've not already met) to the giant planktonic larva Planctosphaera pelagica Spengel, 1932. 'Giant' is, of course, a relative term. 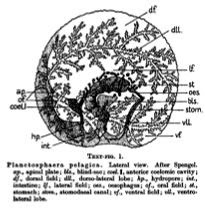 The roughly spherical Planctosphaera reaches about 10mm in diameter (van der Horst, 1936) or even 25mm (Williamson, 2001). A diagram of the internal anatomy above comes from van der Horst (1936). Compared to its generally believed closest relative, the tornaria larva of Enteropneusta (acorn worms), this is huge - tornariae may be about a millimetre in size (Bourne, 1889). The intriguing point about Planctosphaera is that the adult form has never been identified. The similarity between Planctosphaera and tornariae means that it is almost universally accepted as a member of the Hemichordata (see the comparison to the left between the two, again from van der Horst), but it is different enough that the adult may not be a typical acorn worm (not to mention the size...) Williamson (2001) provides one exception - he maintains that Planctosphaera as currently known is the adult form. However, this interpretation is connected with Williamson's unusual theory of 'larval transfer', which is not widely accepted*, and jibes with the fact that known Planctosphaera do not have any sort of gonads or other reproductive structure (van der Horst, 1936). *Williamson maintains that distinct adult and larval forms in various animals result from hybridisation between animals with distinct bauplans, with one stage in the life cycle resembling one parent and one resembling the other. For instance, caterpillars and other insect larvae would be derived from a hybridisation between a direct-developing winged insect and an onychophoran-like animal. First, try to imagine a butterfly mating with an onychophoran. Then, try to stop imagining a butterfly mating with an onychophoran. One imaginative interpretation of Planctosphaera that does have a lot going for it is the idea that Planctosphaera is a normal tornaria larva that has become hypertrophied by a long planktonic period. The reference for this idea is Hart (1994) - unfortunately, I haven't been able to obtain the paper in question and I am unclear whether this is meant to be an adaptive change, or whether Planctosphaera represents a pathological form of a normal tornaria that has failed to develop in the normal way. Such pathologies are not unknown - Temereva et al. (2006) describe a giant phoronid larva (which even possesses rudimentary gonads!) that they interpret as such, and note the existence of giant larvae of ceriantharians, sipunculids and even fish. Of course, the adult form of Planctosphara could still be out there somewhere, lurking in the ooze at the bottom of the oceanic abyss. As the relatively recent description of Torquarator Holland et al., 2005 demonstrated, we may have only scratched the surface of enteropneust diversity. Bourne, G. C. 1889. On a tornaria found in British seas. Journal of the Marine Biological Association 2 (1): 63-68, pl. 7, 8. Hart, M. W., R. L. Miller, & L. P. Madin. Form and feeding mechanism of a living Planctosphaera pelagica (phylum Hemichordata). Marine Biology 120: 521-533. Holland, N. D., D. A. Clague, D. P. Gordon, A. Gebruk, D. L. Pawson & M. Vecchione. 2005. 'Lophenteropneust' hypothesis refuted by collection and photos of new deep-sea hemichordates. Nature 434:374-376. Horst, C. J. van der. 1936. 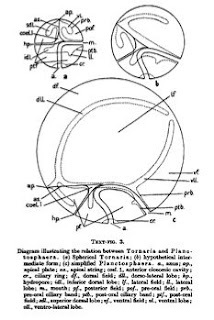 Planctosphaera and Tornaria. Quarterly Journal of Microscopical Science: 605-613. Temereva, E. N., V. V. Malakhov & A. N. Chernyshev. 2006. Giant actinotroch, a larva of Phoronida from the South China Sea: the giant larva phenomenon. Doklady Akademii Nauk 410 (5): 712-715 (transl. Doklady Biological Sciences 410: 410-413). Williamson, D. I. 2006. Hybridization in the evolution of animal form and life-cycle. Zoological Journal of the Linnean Society 148: 585-602. Maybe this is a stupid question, but why not just catch some of the larvae and keep them in a tank somewhere? I believe people have tried, but so far no dice. Attempts to extract DNA sequences have so far failed as well, AFAIK. The failure to show any signs of developing further doesn't necessarily mean anything, in my opinion. I don't really know anything about hemichordate development, but my impression on hearing colleagues discussing attempts to raise juvenile arthropods to species-identifiable adults is that at least some animals are quite happy to continue life as immatures almost indefinitely until some external stimulus (rise in humidity, change in day length, whatever) is received. The fairly constant conditions in captivity may be failing to supply some vital stimulus for Planctosphaera development. Ah, that's interesting. But what about these animals makes extracting DNA more difficult? Wouldn't have a clue. There may not even be a real reason - it may just be a combination of bad luck and shortage of available specimens. (I used to joke that getting a PCR to work was mainly influenced by how you held your tongue while preparing the tubes, the direction of the wind, and the phase of the moon - my point being that sometimes PCRs just failed for no obvious reason).